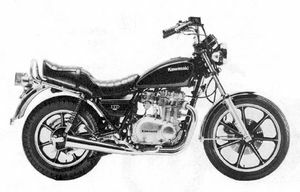 The Kawasaki KZ440A is a motorcycle produced by Kawasaki from 1980 to 1983. Remarks: American style sports model. Front disc & rear drum brakes, stepped seat, pullback handlebar, cast wheels. 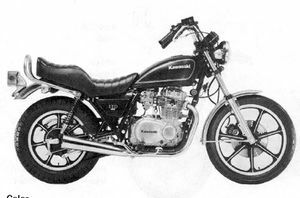 Major Change: Color & graphic, transistorized ignition system, self-cancelling turn signals.